Jasmin is pregnant and expecting a little girl. More baby talk will be posted on her blog "Better than Yarn". We will be talking a baby break of undetermined length when the baby is born. Gigi has finished another Citron out of sparkly Huckleberry with a beaded bind-off. Jasmin finished a UFO: the Oat Couture Prairie Blanket. She is also working on a Sothia Shawl out or her own left over handspun, but the ruffle feels like it will never end. She also is working on a pair of vanilla socks out of Trekking. Also, she finished a Zoom baby sweater out of Tess Yarns Superwash Merino. Gigi finished one Daybreak out of Conjoined Creation Flatfeet with navy blue contrast in Cascade Heritage, and another one out of Claudia's Handpaints in the San Jose Sharks colorway with some black Cascade 220 Sport for contrast. Also , we mentioned Project Runway. One of the Designers wore a scarf that looked like the Morehouse Mouse scarf. He said he designed it himself. We are impressed by Anya. We talked about buying yarn for the stash. Gigi has been trying to organize her knitting, sewing and quilting stash. And she has reached SABLE. Advice : buy enough to finish a project, and maybe some extra balls as to not run short. Beware of trendy yarns: eylash, bulky, fun fur. 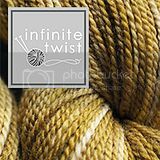 We discussed the Bobbin's Nest stash sale. 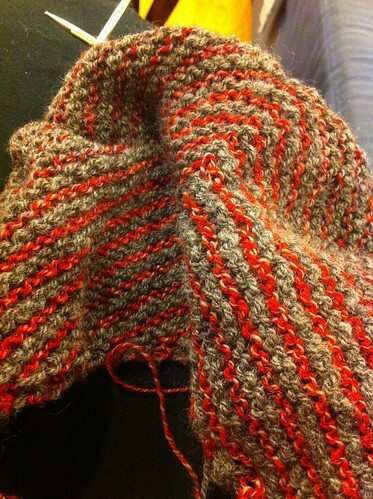 Gigi has been working on the Taygete by Romi Hill, and has problems reading lace. Lots of stitch markers and using the charts instead of the written directions help. Jasmin had an amazingly pretty day and was buying a bunch of circular needles, and somehow managed to put back the needles she had picked and instead take the needles she didn't need to the cash register. Knitting Beyond the Edge , by Nicki Epstein. Wonderful finishes and flourishes for plain knitting. We liked it a lot, and enthusiastically recommend it. Tour de Fleece: Epic Fail for Gigi. Jasmin failed Team Sasquatch, and didn't realize her goal of spinning a Goodale's (sweaters) worth of yarn, but her woolen spinning improved. Now she is working on plying the yarn she spun for knitting Andrew's sweater, the Baseball Sweater from Knits Men Want. She is enjoying spinning Crown Mountain Farms Superwash Merino in "Material Girl" on her new travel wheel, the Sidekick, the new folding wheel by Schacht. Andrew was impressed and Jasmin really likes it. Jasmin attended the Monterey Wool Auction. She dropped off some fleeces with Sherri for Morro Fleece Works, and learned about alpaca fleeces. Miss Kalendar scored four fleeces, Jasmin came home without any, she liked some but they were bid up higher than she was willing to pay for. This year the highest fleece was bid up to over $40 per pound. I'm uploading the latest episode to my phone right now for the commute home. Can't wait to hear all the wonderful deets! Welcome back! Yeah! I missed you two and look SO forward to learning about baby! Please let anyone other than Joshua win Project Runway, maybe Anya, I a undecided on a winner just can't stand Joshua...ugh. Yea! on the new Blessing that will arrive in your life! Jasmine you will make an awesome mom! You will love it your life will change so much. I am so happy for the both of you! I am so glad you are back and really missed your show. I am downloading the new episode now. Welcome back! Enjoyed the podcast and the discussion on stashing. I've gotten really involved in quilting and stashing fabrics. Wondering if Gigi has any thoughts on stashing fabrics? Apparently, Anya has been hand sewing since she was a little girl, but just learned to machine sew 4 months ago. A little misdirection on the shows part, I believe. There's an App for us! Visual featurette tutorials by the Knitmore Girls! Couture button tutorial from Jasmin and Gigi on Vimeo. Grosgrain Ribbon Tutorial from Jasmin and Gigi on Vimeo. All donations collected go towards podcast production costs. Make your own Knitmore Vanilla Socks! With their own custom label! Interested in having an ad in the Podcast? On the Podcast blog? Contact us at jasmin@knitmoregirlspodcast.com for details. the charming and talented Patrick Lydon. Jasmin and Gigi are participants in the Amazon Services LLC Associates Program, an affiliate advertising program designed to provide a means for sites to earn advertising fees by advertising and linking to amazon.com.